Pisces (♓) is the twelfth astrological sign in the Zodiac. It came from the Pisces constellation. In western astrology this sign is no longer aligned with the constellation. This is because of the precession of the equinoxes. It is also considered a water sign and one of the four mutable signs. The symbol represents 2 fish, swimming in different directions. The two shapes are also crescents, facing outward, which represents the idea that Pisceans are open to new things and to change. Pisces has been traditionally ruled by the planet Jupiter, but since its discovery, Neptune has been considered a modern ruler of this sign. Being the twelfth sign, Pisces is associated with the astrological twelfth house. Individuals born when the Sun was in this sign are considered "Pisceans". The Sun can be seen 1n Pisces from about February 19 to March 20, ending at the moment of vernal equinox by definition under the tropical zodiac. Under the sidereal zodiac, it is generally there from about March 15 to April 13. 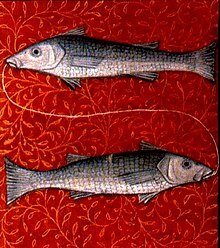 Wikimedia Commons has media related to Pisces (astrology). This page was last changed on 18 February 2018, at 20:34.